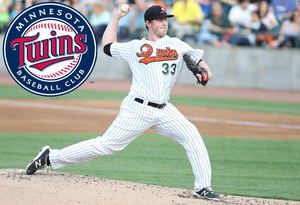 (Central Islip, N.Y., June 10, 2017) – The Long Island Ducks today announced that right-handed pitcher Tim Melville’s contract has been purchased by the Minnesota Twins organization. He will join the team’s Triple-A affiliate in Rochester, N.Y.
Melville made nine starts with the Flock and compiled a 3-4 record with a 3.45 ERA. In 47 innings of work, the righty struck out a team-high 48 batters while walking only 18, and he allowed 21 runs (18 earned) on 41 hits. Most recently, the Virginia resident struck out 14 batters over six scoreless innings in a victory over the New Britain Bees on Wednesday, June 7. The total tied a franchise single-game record, set previously by Mike Loree on September 14, 2011 at Southern Maryland and Rich Hill on August 9, 2015 against Camden. Both pitchers eventually had their contracts purchased by outside organizations as well. The 27-year-old has previous Major League experience with the Cincinnati Reds, making three appearances (two starts) with the club in 2016. Prior to joining the Ducks, he spent time in the Kansas City Royals, Detroit Tigers and Reds organizations. He reached the Double-A level with the Royals in 2012 and 2014 before advanced to Triple-A with the Tigers in 2015 and the Reds in 2016. Melville was originally drafted by the Royals in the fourth round of the 2008 amateur draft. Melville becomes the first Ducks player during the 2017 season to have his contract purchased by an MLB organization and second by an outside organization. He joins infielder Nate Freiman, whose contract was purchased by Pericos de Puebla of the Mexican League on April 29.